I wore it when I was little girl, but it’s too warm. 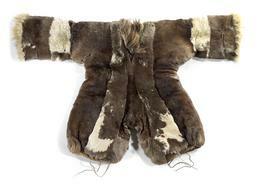 In winter, women and girls on St. Lawrence Island traditionally wore the qallevak, a one-piece suit made of reindeer fur. This type of clothing comes from Siberia, where people of the island had close connections and many relatives. Estelle Oozevaseuk: Women’s tobacco pouch, and they’re [worn] on their suit. I think there’s a string where they tie that [at side of chest]. On the other side, needle case. My great-grandma used to have that kind [of needle case]. It came from Siberia. They always carried them in their suit, their qallevak [woman’s coverall garment]. (2) You know, those suits that women wore with the opening here [deep v-neck] and with big sleeves. They have legs that are big around [rounded]. It comes down to this [below knee]. That part [bottom of leg] has a string on it. Just pull the string to make it [leg] full to look beautiful wearing them. Suzi Jones: When did they quit wearing that style of suit? Estelle Oozevaseuk: I wore it when I was little girl, but it’s too warm. That’s the only time I wore it and then nothing after that. My younger sisters did not. Mine was Siberian made with white stripes down the [chest] and sleeves, and also edged with very long dog skin. And it’s itching. I complained to my grandmother about it often. 1. The Elders did not look at a combination suit, but Estelle Oozevaseuk described it briefly while discussing other items, from which these comments are taken: needle case 045206.000; tobacco bags E316649, E316663 & E280164; and boots 193374.000 & 116767.000. 2. A qallevak [woman’s coverall garment] is made from reindeer skin with a deep V-neck, long arm sleeves and pant legs to just below the knee. In winter, women and girls on St. Lawrence Island traditionally wore the qallevak, a one-piece suit made of reindeer fur. It had wide sleeves, a V-neck, and short pant-legs that tied over the tops of a woman’s boots. This type of garment is distinctly Siberian in its origins, and was also worn in the Chukotka and Kamchatka regions by Yupik, Chukchi, Koryak, and Itelmen women. (1) It did not occur elsewhere in Alaska.